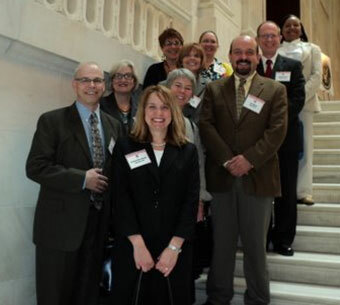 Ohio’s Library Advocates pose for a picture on the steps of the Russell Senate Building after the group had met with Senator Portman’s office. Ann M. Watson and Alison Ricker represented Ohio’s academic libraries during the 2011 National Legislative Day held on May 9-10 in Washington, DC. Twelve individuals representing Ohio libraries, including State Librarian Beverly Cain, met with Legislative Aides for both House and Senate members from Ohio. Below is an excerpt from information provided by the ALA Office of Government Relations handout which provided us with information to share to share during our Congressional office visits. On April 14, 2011, after vigorous partisan debate, behind-the-scenes haggling and a nation wondering if the federal government would shut down, Congress finally approved the FY2011 budget for its final five months, ending September 30. Congress made a .2 percent across-the-board cut to all federal programs and made $38.5 billion in cuts to both mandatory and discretionary spending compared to FY2010. IMLS received a 10.7 percent cut from FY2010 levels. Its FY2011 funding is $237,393,262, down $28 million from the FY2010 total of $265.8 million, which does not include the $16 million IMLS lost with the elimination of all federal earmarks from the FY2011 budget. Like other agencies, IMLS must now determine how the cuts will be made with final approval by the Office of Management and Budget (OMB.) The cut to the Library Services and Technology Act (LSTA) is $24,487,678 for a total of $189,035,322. The FY2011 cuts were based on the cuts recommended by President Obama in his FY2012 budget request, which was released on February 14, 2011. The ILSL program was not even individually included in the FY2011 spending bill. The U.S. Department of Education must now determine where cuts will be made in its many programs, although it is not likely that the Department will replace the ILSL budget line. ILSL was funded at $19.1 million in FY 2010. The Library of Congress (LOC) also saw its budget cut in FY2011. This year the LOC budget will be $14.3 million less than it was in FY2010 with an FY2011 budget of $629 million. FY2012 is expected to see even deeper cuts as Congress tries to control government spending in the wake of concerns over a huge federal deficit. There is one thing that everyone seems to agree on: The battle over FY2012 will be even more raucous and difficult than the debates to resolve FY2011. President Obama sent his proposed FY2012 budget to Congress on February 14, 2011, calling for a $20.3 million cut to LSTA down to $193.2 million and a total cut to IMLS of $40 million under FY2010 levels. President Obama again proposed that this school library program be consolidated with five other literacy programs, Striving Readers, Even Start, National Writing Project, Reading is Fundamental, and Ready-to-Learn. Such a consolidation would mean that all of the programs compete for a piece a $383.3 million pie. Since ILSL is the smallest of these programs, it would be unclear how much they would receive. Congress is expected to choose to follow the President’s recommendation of a consolidation or total elimination. The House and Senate Appropriations Committees would determine how to fund each of these consolidated programs. President Obama’s FY2012 budget request calls for $674.7 million to LOC, which is a $45 million increase over the recently passed FY2011 budget. While the library community fully recognizes the Congressional mission to balance federal budgets, Congress should recognize the essential roles that libraries serve, and the unique function of federal library funding which supports partnerships and fundamental new services to help libraries be more efficient at maintaining basic services. Libraries are especially critical in the roles they serve in providing federal e-government services, employment services, and support for education. Additionally, the public will continue to increase the demand for library services as other federal programs are cut and more agencies refer people to their local libraries. The library community seeks parity and fairness relative to cuts made in other education and service programs.